Enthusiast camera, meet the rest of the world. 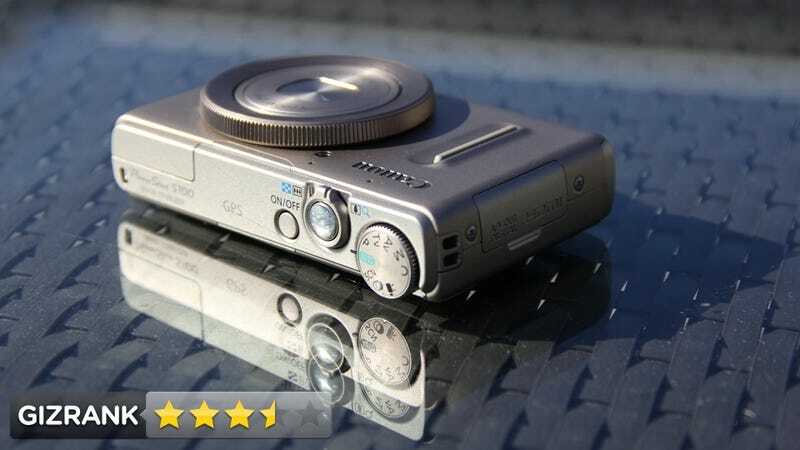 The S100 wants to be more than just a super-compact point-and-shoot that takes excellent pictures. It's an everyman's rig that shoots Full-HD (1920x1080) video, has a battery of advanced settings, and a GPS chip to boot. The S100 also sports a lot of new hardware that Canon hasn't extensively tested elsewhere. It's only the second camera to come with the brand new Digic 5 processor, which is rated six times faster than its predecessor. It significantly improves automatic white balance and noise reduction. Pretty impressive considering the Digic 4 was used in everything from the Canon S95 to epic SLRs like the T2i and the 5D Mark II. Canon's also swapped out the 1/1.7" 10-megapixel CCD sensor for a beefier 1/1.7" 12-megapixel CMOS. It's the first camera of its kind to experiment with a CMOS. The S100 doesn't change much about the excellent design that makes S-series cameras such a joy to use in manual mode despite their diminutive sizes. In this mode, aperture and shutter speed are controlled by the function ring around the lens and by a click-wheel on the back. Feeling spunky? You can change what the ring does with a button on the back panel. On the top panel, you select between all the modes you'd expect on a camera designed for manual use: Av, Tv, P, M, C modes. The famed low-light shooting pre-set is gone, having swapped places with a former menu item—a high-dynamic range mode for shooting in contrasty settings. A record button on the back panel starts video recording. As before, all of the other shooting settings—which ones depends on the modes you're in—are buried behind the Func Set button on the back. The difference is that what used to be a streamlined list of essential settings for ISO, white balance, format, and metering, has ballooned with new features. Some sound cool—a high-speed burst setting which shoots eight stills in a row and a super-slow motion video setting—but there's also a slew of options and settings you'll probably never touch. GPS is controlled from the camera's menu. Simply stated, the S100 makes shooting photos a pleasure. It's fun to shoot with and the results are excellent. It's honestly fun enough to make you remember to throw it in your pocket—even thought there's a smartphone in there with an 8-megapixel camera. The photos are fabulous, and for that you can thank the new Digic 5—don't be surprised if you suddenly feel like a better photographer. The new 12-megapixel sensor takes sharp 4000 x 3000 images that stay relatively noise free even at the maximum 6400 ISO (though it's better to stay below 1600 unless totally necessary). Despite its demotion to a menu item, the already great "Handheld NightScene" setting has substantially improved, and now shoots full resolution photos. The automatic white balance, which can set colors at multiple points in the image instead of just one, is so excellent that you can almost forget about setting the color temperature manually. Finally, you can shoot JPEGs instead of RAW with confidence. And this thing is unholy fast. The performance is so good that taking a picture stops being a chore and becomes second nature—like taking out your phone to read and answer a text message. The camera finds focus instantaneously and the shutter fires almost without hesitation. When that shutter fires exactly when you think it will, that means you're steadying your body and timing the shot better. What an amazing bit of feedback. Everything else on the camera is a bonus: The HD video and super slow motion video both work well enough. The built-in GPS functionality is neat-o: not a must-have, but it makes it easy to map your photos using either Canon's bundled software or using other tools by Flickr, Aperture, Google Earth, etc. So you've been liberated right? The Canon is fast, fun, and portable. Then you wake up one day to go apple picking or to go to the beach or you wake up one evening and go to a party—whatever. You bust out your trusty camera. It's dead. Or maybe you charged it completely overnight, shot for a while, and then pull it out of your pocket: dead. Turns out, that new Digic 5 processor is not all rainbows and puppy kisses. The camera is good for about 200 photos from a full charge. That's nothing. The S95 and S90 drew way better battery performance and could hold a charge for months. Here's the problem: Canon installed a major upgrade to the image processor—along with a higher-resolution sensor, new battery-sucking features like HD video, slow-motion, high-burst, and GPS. All of this and the battery barely increased in size, from 3.7 V 1000 mAh to 3.7 V 1120 mAh. After all, how could you fit much more battery into this camera and still keep it pocket-size? If you're willing to look past this single serious performance flaw (buy a spare battery? ), the rest of this camera's issues are merely minor annoyances. The camera nearly always prioritizes ISO over shutter speed in automatic settings, which isn't great if you've got shaky hands. And while all the new features are well and good, the camera feels a tad cluttered with settings behind the menus—a sharp contrast to the otherwise sleek design. At times, it can feel more like a tool box than a tool. The Canon S100 is an amazing camera. And I wouldn't buy it. As a Canon devotee, you have no idea how hard it is for me to say that. Don't get me wrong, there are plenty of reasons to buy this camera: It's tiny, fast, takes great photos, and has awesome functionality at a very reasonable price. None of that matters if the camera won't turn on. This camera is the germ of something great, but it's not fully developed. If you go for it, keep the battery on the charger, pack a spare, and be ready to babysit—because this camera is not quite grown up. A lot of you in the comments have questions about the battery so let me clarify a few points. Both the S95 and S100 are rated at 200 shots per charge and the S90 is rated slightly higher. In my experience with both the S90 and S95, I would use the camera heavily for a day without the camera dying. Many, many hundreds of photos over hours and hours. Earlier this week, I took the S100 battery off the charger and after about 2 hours/200 photos, the S100 died. As one commenter pointed out—very rudely, I might add—this is distinctly different from the months I spent on the same S90/95 charge. Now we're talking about standby battery life. "Does the battery hold its charge?" I'm on about a month since my last S90 charge. It's still running and use it for work 3-4 times a week—that's pretty good. I woke up to a dead S100, but I can't say for sure that's a standby problem. But I'll tell you what, since you guys are such good sports, I'm going to look into this and keep you posted. If any of you have managed to get your mitts on an S100—I'm dying to hear what you think. So let's talk GPS quickly. A number of you asked if I noticed a difference in battery life when I turned the GPS off. Well actually some of you instructed me to turn my GPS off—I'll just take that as a different way of asking the same question. We all know GPS polling kills phone batteries, so why not a camera? Yes, I turned it off, and yes it makes a difference. The S100's GPS not only tracks your photos, it has a separate function that keeps a GPS log by periodically checking into the heavens—even when you turn the camera off. It won't stop until you go into the camera menu and turn it off, which since I never go into the camera menu, it would be easy to do. Still after turning the GPS off, the camera still dies noticeably quicker than the previous models.